Red Angus Cows by Naomi Friend. Cyanotype, spraypaint, and acrylic on cotton, 32x60". 2018. Added on August 23, 2018 by Naomi Friend. The Iowa Department of Agriculture and Farm Bureau Federation partner with the Iowa Department of Cultural Affairs to celebrate works of art that capture the beauty and diversity of Iowa’s rural landscapes and agriculture. The 2018 “Celebration of Iowa: Agriculture Art Exhibition” showcases 10 artists in adult and youth divisions who will be awarded cash prizes. The winning entries will be on display Aug. 1 through Oct. 31 at Café Baratta’s at the State Historical Museum of Iowa. Final awards to be announced August 28, 2018. 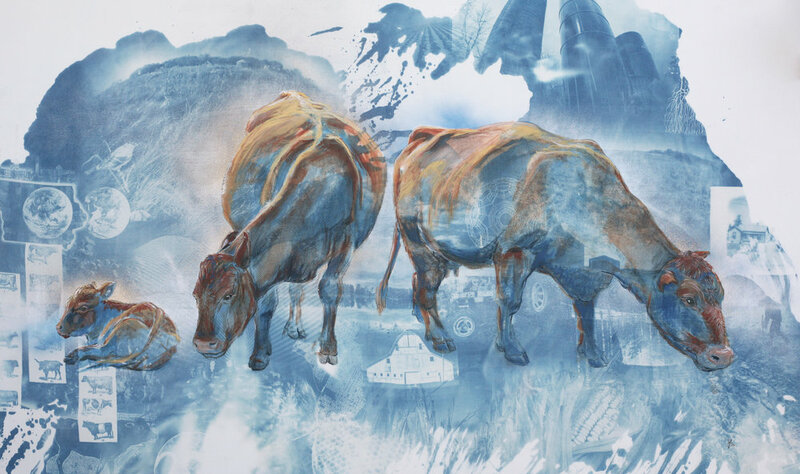 Red Angus Cows is made with a combination of photography and painting techniques. Cyanotype chemistry, an antique photo process, is hand-painted onto fabric and exposed with negatives that I create using photographs of Iowa themes. After the exposure developed, I stretch it onto canvas stretchers and do a painting on the surface. This piece is inspired by the challenges farmers face in continuing their work in a changing culture and environment. The exposure includes glimpses of the past - grain silos, prairie, and historic breeds of cattle and more. Prairie springs from deep Iowa soil, while images of flooded fields and an Iowa watershed map reference agriculture’s modern challenges. The painting of the Red Angus Cows celebrates the role of farmers and their partnership with their livestock. Iowa farmers today continue their work of breed specialization through new farming technologies and biology tools. The food solutions of the future will be based on the hard work of the past. Thanks to our panel of judges - President Craig Hill of the Iowa Farm Bureau, Secretary Mike Naig of theIowa Department of Agriculture and Land Stewardship, and Director Chris Kramer of the Iowa Department of Cultural Affairs. — with Mike Naig for Iowa Agriculture, Iowa Farm Bureau, Iowa Department of Agriculture and Land Stewardshipand Iowa Culture at State Historical Museum of Iowa.